At Bryant Park we're always on the lookout for new trends. In 2008, one of our staff members read a New York Times article about the resurgence of table tennis in New York City, and we thought it would make a perfect addition to the park. You never know where you'll find inspiration. 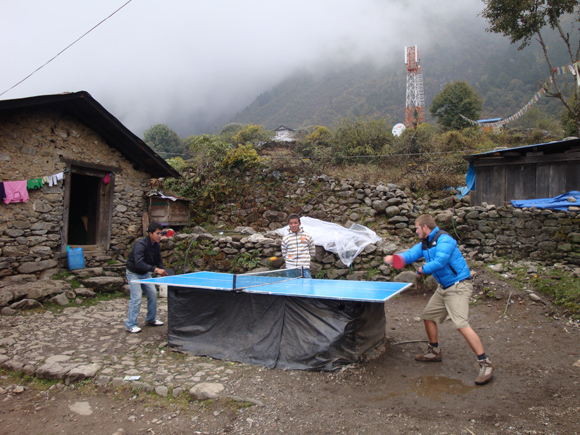 Former Bryant Park blogger Katie Kritzalis spotted this ping pong table, while trekking in Nepal. The table sits at the base of the Himalayas in Lukla, the small town that most people fly through to access the Mount Everest Base Camp on the Southeastern Ridge. It just goes to show that ping pong was a good choice for the park. It speaks to people of all ages, backgrounds, and skill levels. Anyone can pick up a paddle and enjoy a friendly game with a stranger. There's a reason that Ping Pong Diplomacy worked.